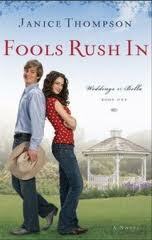 My Series Sunday pick is Fools Rush In, the first book in the Weddings by Bella series by Janice Thompson. Bella Rossi is a 29-year-old single Italian with a wedding facility named after her. When her parents hand over the family wedding planning business, Bella is determined to be successful. Her first theme-styled booking is a "Boot Scoot'n" wedding. But Bella knows nothing about country music or Texan life. Her pizza-making Uncle has mob ties; her Aunt chases neighbor kids, and they only listen to Frank Sinatra and Dean Martin. Will she pull it off in time? The entertaining part of Fools Rush In is Bella's lively family that lives under one roof. They remind me of the Italian version of The Plums (Stephanie Plum series). I would have preferred the romance portion to not move so fast and easy. Although, the title of the book is about fools rushing in. The odd part of the book was the many religious references and praying. This is not the norm for light chick lit, making it borderline Christian fiction. I wasn't surprised to learn that the author is a Christian freelancer. Rest assured, this book is not preachy. I can't say that I'm in amore with this series, but I will give it another try by reading the second and third book (priced at $5.59 each for the NOOKbooks). A part of me wants to know how the entertaining, funny Rossi family fares out. I have that book on my NC, haven't gotten around to reading it yet. Thanks for participating in Series Sunday and posting your review. I'm headed over to read it now. Once you finally read Fools Rush In, let me know your thoughts.